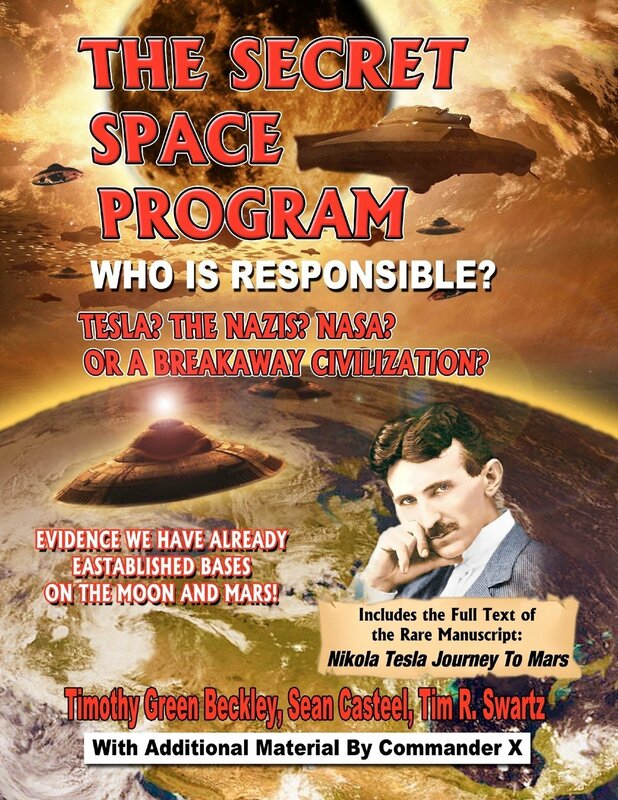 REVIEW: THE SECRET SPACE PROGRAM : WHO IS REPSONSIBLE?? It seems as though discussions about the Secret Space Program are very en-vogue right now and seem to dominate the conspiracy genre, with several high profile new books coming out and more on the way. So it was with this burgeoning interest that I picked up the latest book by the writing team of Tim Green Beckley, Sean Casteel and Tom Schwartz, with additional content from the very mysterious Commander X and was I in for a roller coaster. What makes this book different from the others is its premise and discussion about Tesla. 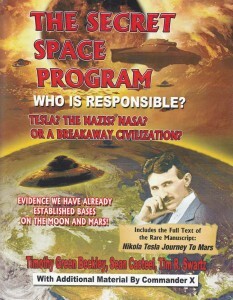 Many of the books out there, and my own research I’m afraid, has centered around the Nazi UFO programs of World War 2, but this book departs from that discussion to approach the secret space program from the Tesla angle. A very interesting approach it is. The inclusion of Commander X’s content was also an interesting because the Commander has been largely silent for sometime. The book is laid out in sections and as you would expect delves into the Nazi programs as well as some other high technology programs but really the gems here lie in the analysis and discussion of the Tesla technology. It also has some interesting points about Gary McKinnon as well as a discussion about Dwight D. Eisenhower’s grand daughter and is chock full of salient points and interesting angles which I have come to expect from these writers. And while not as thorough as Farrell’s books on the subject does make you wonder about what is going on up there and who is really responsible. The other interesting part of this book, and almost worth buying it alone are the photos the authors have dug up. There are some very interesting ones in there which warrant further analysis and discussion. So the final analysis? Good thought provoking book and a good read. This book will make you wonder, but in general lacks that depth of others. So I would suggest this book as a fantastic overview of the subject and maybe the gateway book for your explorations on the secret space program.